Halloween is rapidly approaching! 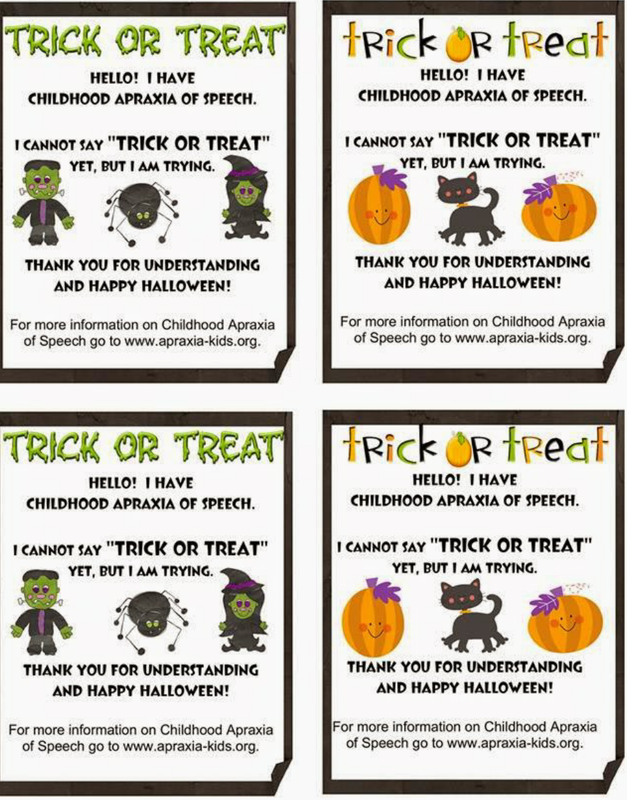 It got me thinking about my preschoolers with apraxia and other expressive language deficits. 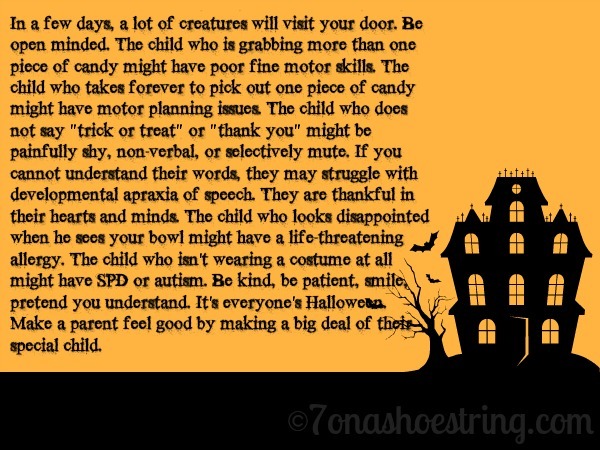 What can be done for the children who are unable to say "Trick or Treat?" 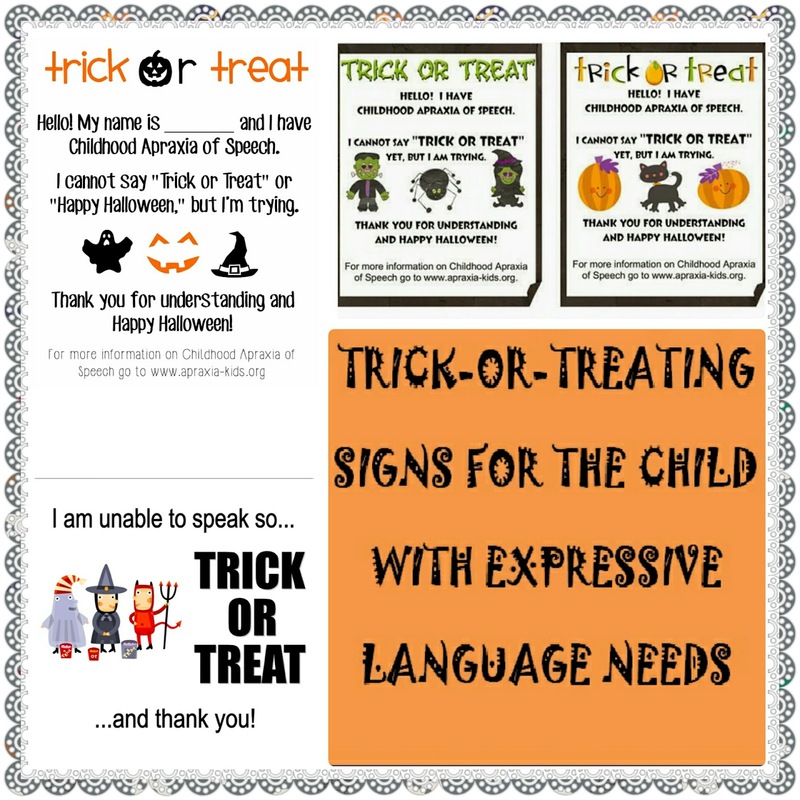 A brief chat with one of my favorite #SLPEEPS on Twitter inspired me to compile a list of signs that our children can use on Halloween. These can be handed out or affixed to a costume. 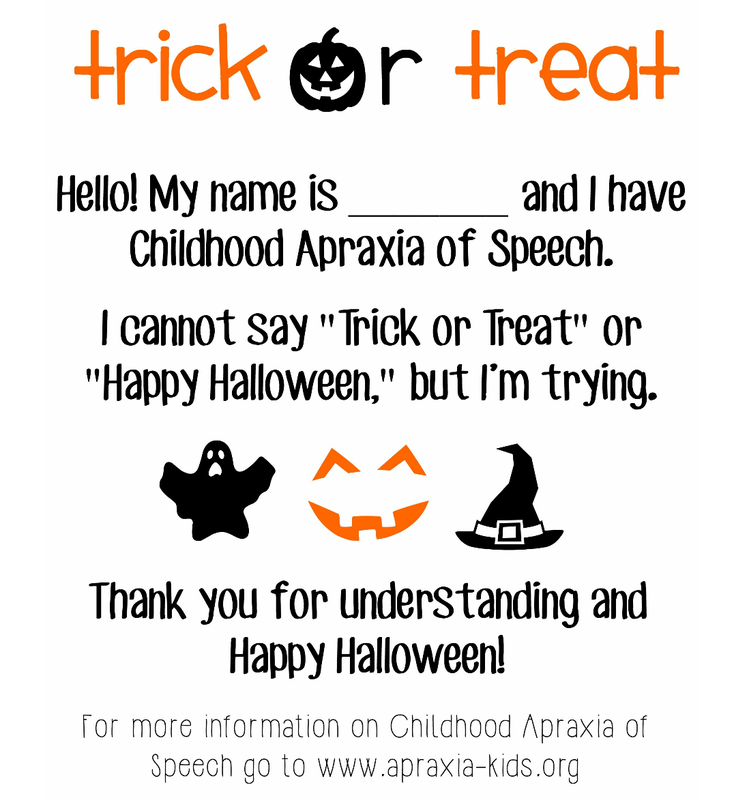 It also will help to bring awareness to apraxia and other speech disorders. Don't you just LOVE the internet?! So many great resources floating around! 1. 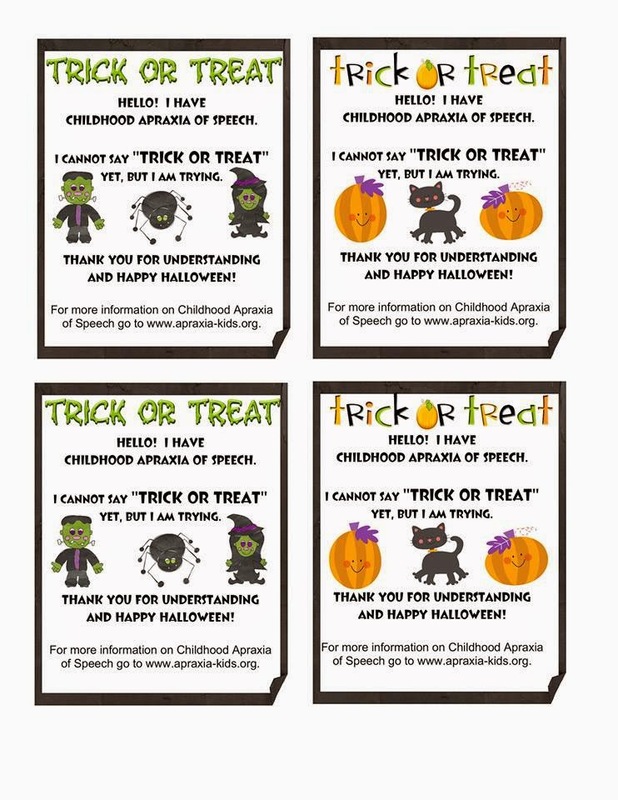 Editable Halloween card children can hand out the night of Halloween. 2. Thank you so much for your kindness! Like above, these can be handed out the night of Halloween. 3. 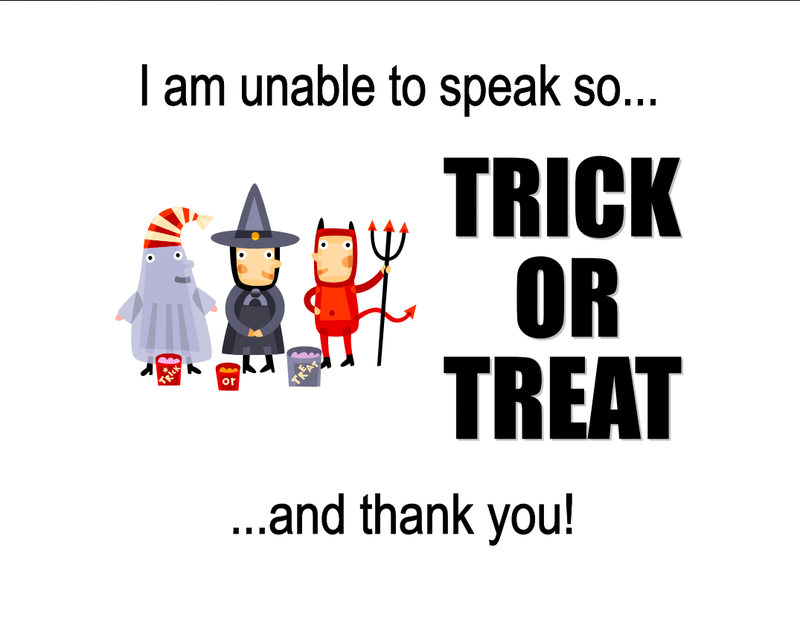 I am unable to speak so...Trick or Treat...and thank you! Halloween is a time for children to let their imaginations run wild, ALL children. During this time I like to be reminded of this with a quote that has been floating around the web for some time. I'm not sure of it's origination, but it certainly captures the a sentiment we should all keep in mind. 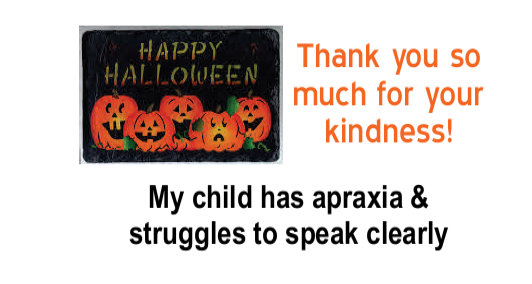 What will you be doing for your children with limited expressive language this Halloween? How about programming a one-button switch with a pre-programmed message? You could use a Step by Step or a Sequencer and put in more messages like "Trick or Treat" and "Thank You". I like your idea of explaining to others that not everyone communicates the same way. Thanks for commenting Ryan. Great idea about using a pre - programmed message!